But in time, the past caught up with the Castellanos family. With the release of their extraordinary documentary film The Rescue, Alvaro and his younger brother Boris haven’t just faced up to their clan’s history. They have turned it into high art. Alvaro and Boris came to Canada as immigrants during the height of the civil war in native El Salvador. Their first home was in Pickering, a predominantly white, middle-class Toronto suburb. This was a household run by their mother and aunt. The boys’ estranged father remained in El Salvador, an almost entirely unknown figure in their lives. That’s an understatement. Boris and Alvaro immersed themselves in heavy metal, rock and other musical genres, and later began careers as techno musicians and DJs. They also rediscovered classics of Latin America popular music from the early and mid 20th century, when Latin America was turning out musical genii such as Carlos Gardel, Xavier Cougat, Tito Puente and Celia Cruz. Eventually, Boris and Alvaro moved out of the suburbs and into Toronto, building careers around a 24-hour home-care schedule for their ailing mother (whom I had the privilege of meeting a number of times). Playing on their comedic skills in both English and Spanish, the Castellanos brothers tuned this multi-ethnic city into their creative oyster. I first met them a decade ago, when I was Executive Director of a Jewish charity involved with projects in Africa, where I’d worked for 16 years as an anthropologist. I explained that we were bringing in Elie Wiesel, the late author and Holocaust survivor, to speak to our group. Wiesel was famous for mumbling; and on a good day, only the people sitting in the first 10 rows could hear him clearly. I asked Boris and Alvaro to apply their skills as music producers to the task. When the day of the event arrived, Wiesel’s voice carried to every corner of the auditorium. The three of us became friends. And when the brothers discovered that I could play guitar in Latin American styles, we ended up jamming together—and even did a few professional gigs. But music is just one component of the Castellanos’ new multimedia production, The Rescue. Having worked closely with Jewish organizations in Toronto, the brothers slowly became aware of how their family’s history was intertwined with that of Europe’s Jews. Their paternal grandfather, they discovered, was one of the greatest among the righteous gentiles—a man who may well have saved more Jews from the gas chambers than did Raoul Wallenberg. Together, Boris and Alvaro embarked on a personal voyage of discovery—to El Salvador, the United States, Switzerland, Germany, Italy, Hungary and Israel—where they learned about the remarkable tale, picking up the requisite documentary film making skills during their journey. Colonel Jose Arturo Castellanos Contreras (1891-1977) grew up in a wealthy Salvadoran family before joining the military, and rising quickly through its ranks. Everything we know about him—which is to say, everything that Boris and Alvaro learned—suggests that he began his career as a conventional Catholic, and a supporter of the authoritarian, dictatorial style of government that then characterized this part of the world. Yet even so, he was unusually sensitive to the injustices within his society, and spoke out openly about women’s rights, the plight of the poor, and the ongoing persecution of Central America’s indigenous peoples. Despite his status as a military man, Castellanos is said to have had a gentle manner. In surviving photos, he is shown to be well dressed and turned out. Like Oscar Schindler, Castellanos loved a good party, a fine glass of brandy, a Cuban cigar. He ate well and enjoyed the good life, marrying and divorcing several women, while siring more than a dozen children. To put things diplomatically, his personal life was complicated. When his various political causes rankled the government, he was pulled out of the military and appointed Consul General in neutral Switzerland. It was intended as a sort of velvet exile. But in Geneva, Castellanos fell in with a man who would become his first secretary— a Hungarian Jew going by the name George Mantello (originally György Mandl), who laid bare to him the full horror of the Holocaust. Castellanos had, by this time, become alienated by this fascistic tendencies of his own government, and so had no problem co-opting his Salvadoran diplomatic powers to produce life-saving passports and other travel documents for members of the wider Mandel family. The two men then hatched on a larger idea: Why not turn the consulate into a document factory for other European Jews facing the Nazi death camps? 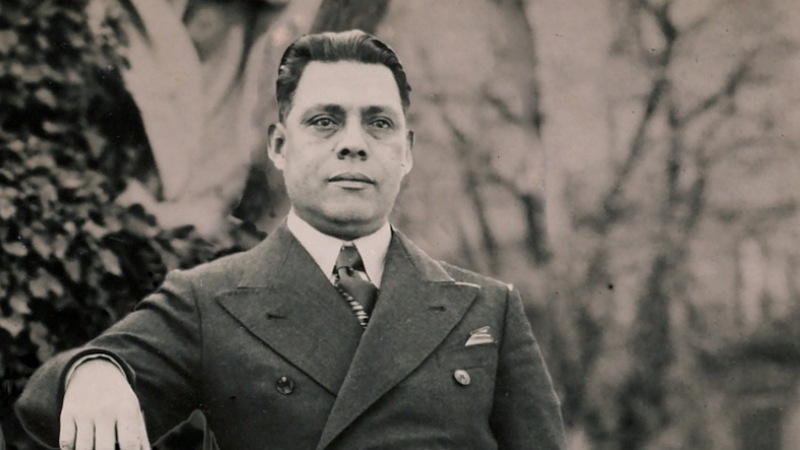 By the grant of Salvadoran citizenship, Castellanos used his office to help save an estimated 40,000 lives. Their descendants now live in Israel, Europe, America, Central and South America. An order of magnitude larger than even Schindler’s “family,” the sprawl of these men, women and children now is so vast as to comprise a Biblically sized tribal multitude. In The Rescue, viewers can see Boris and Alvaro at Yad Vashem in Israel, visiting their grandfather’s commemorative monument in the Garden of the Righteous Among the Nations, and speaking with some of those whom Castellanos saved. In between, Boris and Alvaro appear with other musicians on stage, playing the Latin American songs that were popular during the life of their grandfather, and which supply a mixed-media soundtrack to his heroism. That sense of peace comes through in the movie: Boris and Alvaro visit not only their grandfather’s grave in San Salvador, but also the grave of his son—their father—in the same cemetery. The three generations, in this brief moment, finally are in one place, two brothers and two fathers. A short taste of The Rescue can be found on YouTube. But I’d urge readers to watch the whole thing. Colonel Jose Arturo Castellanos Contreras became a lifesaving hero to legions of strangers, even as he let down those closest to him. Four decades after his death, his grandchildren have found a brilliant and fitting way to join these two strands of one man’s life. This otherwise fine article is marred twice by an unfortunate error of the writer’s judgment: he sees the act of saving Jews as a kind of competition. Since we’re now contrasting the righteous and using superlatives to establish a ranking order, i.e. “one of the greatest”, let’s delve deeper by me allowing myself to commit the same foul to illustrate. Men such as Wallenberg, Castellanos, and Chiune Sugihara of Japan were all diplomats, a status that protected them unless their own governments cancelled their employment thereby ending their protection. Wallenberg and Sugihara performed their admirable deeds in Nazi-occupied Hungary and Soviet-occupied Lithuania, respectively. Castellanos was far safer in neutral Switzerland. Mandl was the one who transported the documents to Budapest where they were given to Swiss diplomat Carl Lutz to issue to Jews. Though a German ally, Hungary didn’t partake in the rounding up of the Jews for extermination (it did enact anti-Semitic laws), so Jews from other nations who could escape there prior to March of ’44, when the Nazis invaded, had a better shot at survival than staying in their Nazi-occupied homelands. Sugihara left Lithuania almost a year prior to the Nazi invasion in ’41, but undoubtedly the visas he issued in 1940 allowed thousands, many of whom were refugees from Poland, to leave before that fateful event. I think most reading are acquainted with the feats of Schindler. Suffice it to say he didn’t enjoy the same protections as the diplomats, he didn’t have passports and visas to issue, and he spent much of his wealth buying reprieves for his Jewish employees and expanding their workforce to save more. Let’s not ignore Schindler faced down Nazi soldiers sent to his factory to gun down the Jews, which is an act of astounding heroism. Yet, Schindler was not hiding Jews in his residence. What of the little guy, those who don’t get articles written about them generally, who sheltered individual and small groups of Jews in their own homes or workplaces? Not only did they need to provide the hiding spaces, which put them and their families in grave jeopardy and almost certain arrest, they had to sustain these sheltered Jews using what little rations were provided by their ration books and supplementing that by the black market. The Germans faced diminishing food rations at home and to a great extent had to rely on supplies from occupied Europe which put pressure on the occupied populations. A country such as Denmark was able to maintain administrative autonomy because it met Nazi demands for food, but to keep what freedom it had the authorities used a firm hand. Food was rationed and distributed by family size, so a family of three or four had to take from their own bowls and cups to sustain those they sheltered. This system was policed to thwart black marketeers and punish those who wanted to get more than rationing permitted. To avoid suspicion they had to vary their purchases from several shops and markets, often traveling far from home, and only carried amounts considered normal, typically one shopping bag. In some cases sustaining the sheltered Jews became jobs themselves because they’d have to make numerous supply runs. Often these righteous were betrayed by their neighbours and co-workers. Can you imagine the pressure these people were under day after day? It was the fortuitous accident of Hermine “Miep” Gies’s Austrian accent that saved her from arrest and being handed over to the Gestapo after Anne Frank’s family was captured. Gies’s courage was boundless as she actually went to the police station and tried to bribe officers to release the Franks. Ms Geis didn’t have a diplomatic passport to wave in an officials’ face. And she wasn’t in the safety of Switzerland. Yes, numerically the acts of Wallenberg, Castellanos, and Sugihara are impressive, and often these were in defiance of their own governments; it is right to recognise these. But using comparatives and superlatives, strikes me as misguided as it overshadows if not diminishes the acts of astonishing heroism by the many who saved, or tried to save, the few. Big numbers tantalise, and it’s easy to be swayed by their power. I think it’s more just to recognise that though numerically different due to each situation, the acts of all were equally heroic and significant whether it was one, 40,000, or even zero in the cases where they were caught. Let the Talmud be the authority on it: Whoever destroys a soul, it is considered as if he destroyed an entire world. And whoever saves a life of Israel, it is considered as if he saved an entire world. This is my opinion on the matter. Your contribution is interesting but did not need to be confrontational. Hungary did partake in rounding up the Jews. Between May and the end of June 1944 close to half a million Hungarian citizens of Jewish background were moved out of their homes into ghettos and from there transported to Auschwitz where they perished, almost with no exception (pretty much the entire Hungarian Jewry from the countryside). This was all managed and run by the Hungarian authorities, the civil service, the police, the gendarmarie and railway workers.There were only about 200 people with Eichmann in Hungary at that time and the Hungarians alone were so efficient in loading up the Jews, mostly women, children and the eldelry as men between the age of 18 and 60 were pretty much all taken to work on the Eastern Front collecting mines and digging trenches, that the authorities in Auschwitz complained they are unable to “process” the shipments in a timely manner. You missed the point, probably because you omitted quite a bit of the sentence you quoted: “Though a German ally, Hungary didn’t partake in the rounding up of the Jews for extermination (it did enact anti-Semitic laws), so Jews from other nations who could escape there prior to March of ’44, when the Nazis invaded…” Prior to the Nazi invasion of March ’44 the Hungarians weren’t shipping Jews to death camps. After the Nazi invaded, deposed Prime Minister Miklos Kallay, installed the cooperative Dome Sztojay, is when the round ups of Jews and their transport to death camps began. So, from September ’39 to March ’44 Hungary was one of the few safe(r) places for Jews in eastern Europe. From March ’44 to August ’44 the Hungarians cooperated until Geza Lakatos replaced Sztojay and ceased deportations. The Soviets invaded Hungary in September of ’44 and an armistice was signed in October. We can certainly criticise the Hungarians for allying with the Nazis, and the deportation of Jews from March to August of ’44 was a war crime, yet when under their own rule and not having a Nazi gun pointed at their heads the Hungarians were not willing participants. In fact, Jews from elsewhere fled to Hungary. Eichmann was able to round up so many Jews in Hungary because it had become a haven for Jews from central and eastern Europe. Presumably many of these were recipients of the El Salvadoran passports. Had Hungary been a participant from ’39 what do you think the outcome would have been? Ours is a side issue for this excellent article and the amazing story behind it (not such a side issue for the Jews in Hungary between 1920 and 1945 though). It seems we fundamentally differ in our views of the relevant part of the history. Hungary, under the rule of Miklos Horthy, introduced the first law against the Jews, called “Numerus Clausus” (closed number), which was a “first” in the whole of Europe, and was followed by a string of laws that gradually stripped Hungarian Jews of their livelyhood and possessions, leading to the ghettoisation of the Jews in the spring of 1944, with the more than willing assistance of the overwhelming majority of the Hungarian populace. It is almost true that Jews were not killed until the Germans arrived, if we happen to disregard the Kamianets-Podilskyi massacre in 1941 where 16,000 Jews, knowingly expelled from Hungary by the government, were summarily shot by German and Hungarian soldiers. The fact that the Russians entered Hungary in September 1944 did not lead to the cessation of extermination of Jews. Under the Arrow Cross government, from October 1944 to March 1945, about 15,000 Jews were murdered, shot into the Danube, tortured to death by the Arrow Cross youth, and another 80,000 deported to concentration camps in Germany and Austria. Nevertheless, many, especially from Budapest, and some from Szeged and other parts of southern Hungary, have survived as a result of the interventions by Castellanos/Lutz/Wallenberg and Kastner, respectively. As I said above our views on this differ and should not be discussed here. as our disagreement has nothing to do with the content of this wonderful article. Which I mentioned by writing it [Hungary] did enact anti-Semitic laws. It took a regiment of elite paratroopers and eleven divisions of Wehrmacht (each division of German infantry being approx.18,000 men) to oust Kallay and then force the purge of uncooperative Hungarian administrators in the ministries. The invasion force was such a surprise and the numbers so overwhelming that it was practically a bloodless coup. The Hungarian military was poorly trained and ill-equipped; its best troops wiped out by the Russians in ’42 and ’43, and by ’44 it was mostly demobilised. Certainly many anti-Semitic Hungarians were promoted in the bureaucracy. The Interior Ministry, which controlled police and state security, became especially powerful as a result of the Nazi invasion and the deployment of the Gestapo to the country. War criminals such as Andor Jaross, Laszlo Baky, and Laszlo Endre were violently anti-Semitic, and these men were able to finally act out their hatred after their superiors were purged. It took about two months for the ministries to be purged and for collaborators to be put in place. Deportations began in May. In addition to being largely uncooperative to Hitler’s demands re Jews, Kallay ran afoul with the Nazis by entering into secret negotiations with the allies. The Hungarian air force ceased attacking allied bombers and downed allied airmen were not handed over to the Nazis, rather they were aided to escape to partisans in Yugoslavia and elsewhere. Hungary refused to allow the Luftwaffe to base fighters in Hungary. In exchange the allies promised to not bomb Hungary, which exposed Kallay to the Nazis: “Why is Hungary not being bombed?” This was a great tragedy because by not being bombed, Hungary’s excellent railroad remained intact to be used to send Jews to their deaths. Kallay also relaxed censorship and enacted other reforms deemed anti-Nazi by the Germans. His final act was to enter secret negotiations to exit the war. Had Hungary been an truly active participant in the Holocaust from the start of the war, crimes such as Kamianets-Podilskyi would have been a frequent occurrence. Hungary would not have been as a country for Jews and anti-fascists to flee to – it was estimated by March ’44 the Jewish population had grown to about one million and other anti-Nazis such as socialist refugees numbered about one million. Many of these people would have been rounded up in their own homelands and sent to labour and death camps. There is a reason why Castellanos, Lutz, Wallenberg, and Kastner were so successful in Hungary; it’s largely do to the lighter touch of oppression of the Hungarian authorities prior to March ’44. And it wasn’t only them. Portuguese diplomats Carlos Sampaio Garrido and Carlos de Liz-Texeira Branquinho were active in Budapest aiding Jews. The “Angel of Budapest”, Spanish diplomat Angel Sanz Briz, issued about 5,000 Spanish passports to Jews in Budapest. Swede Per Anger assisted Wallenberg. Though not a diplomat, Pole Henryk Sławik was able to alter Polish passports of thousands of Jewish refugees in Hungary changing their religion. Had murderous men such as Sztojay, Jaross, and the two Laszlos been in charge from the onset the number of Jews, socialists, and other anti-Nazis murdered not only from Hungary but also throughout Europe would have been considerably higher, likely several hundred thousand more. Imperfect and even immoral as the Kallay government was, it could have been far worse. Of course all of this could have, and should have, been avoided had the French and British enforced the Versailles and Locarno Treaties by stamping out treaty violating German remilitarisation in the mid 1930s. Stalin’s machinations didn’t help. What a cool article. Thanks to the author and Quillette! Very interesting. Thank you. It is good to know that there are heroes in a world that seems to be increasingly full of villains. Next PostDo Advocacy Groups Belong in Academia?